When Meade Layne met deep trance medium Mark Probert in the Autumn of 1946 he could hardly envision that this relationship would profoundly influence his newly founded, informal group, Borderland Sciences Research Associates (BSRA). The channeled information coming through Mark Probert was of an unusual, unique intellectual and philosophical quality when compared with what is usually produced at seances. Several years of discussion with the members of the so called Inner Circle finally resulted in Meade Layne presenting the 4-D or Etheric Theory of ”flying saucers” or Aeroforms as they were then called. 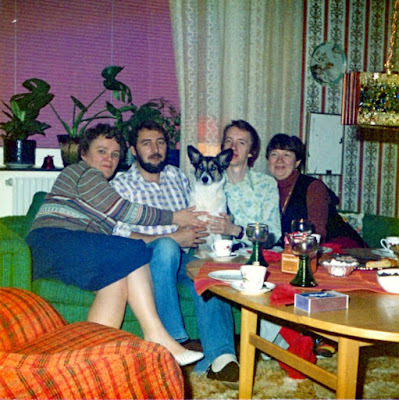 In the Autumn of 1973 I was invited to participate in a meditation group formed by my friends and UFO close encounter witnesses Sture and Turid Johansson, then living at Lidingö, Stockholm. 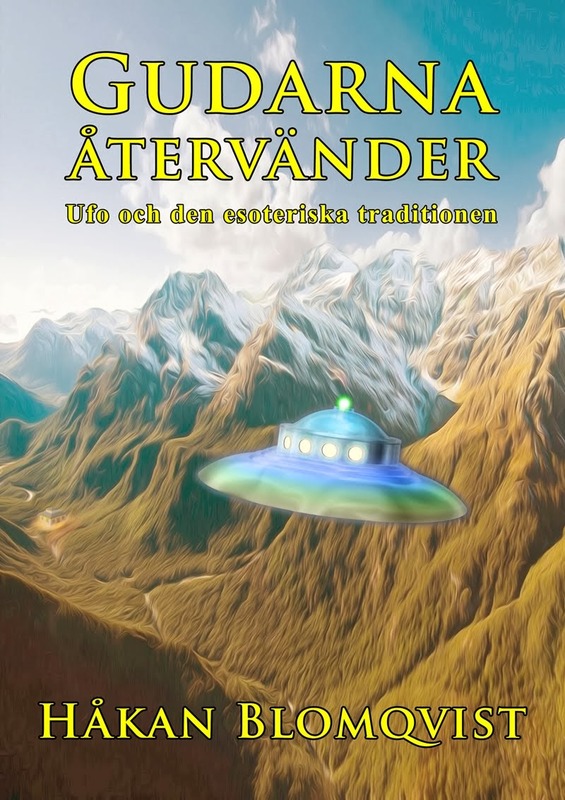 The group consisted mainly of members of the Stockholm UFO-Center. We met every Friday night for several years and became a very tightly knit group and close friends. On November 19, 1976 our meditation session was interrupted by Sture who suddenly began to shake, gasp, rise from his chair and a completely foreign voice said: ”I greet you. Do not be afraid. It is not as dangerous as it looks. What you call the instrument does not suffer from this… But the instrument is still afraid so please tell him that he represents no hazard to you. I am very glad to be here.” Then followed a short explanation of how trance channeling worked and assurance that the man speaking through Sture would be back again many times. 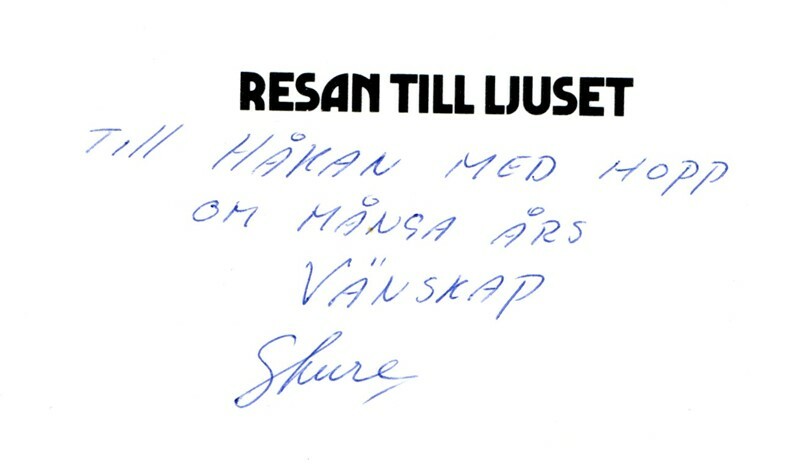 In 1976 and 1977 I participated in many deep trance sessions with Sture och his wife Turid. I taped them all as my hope was that, like Meade Layne and Mark Probert, this could prove to be a serious source of information about UFOs and esotericism, affording help in my research. 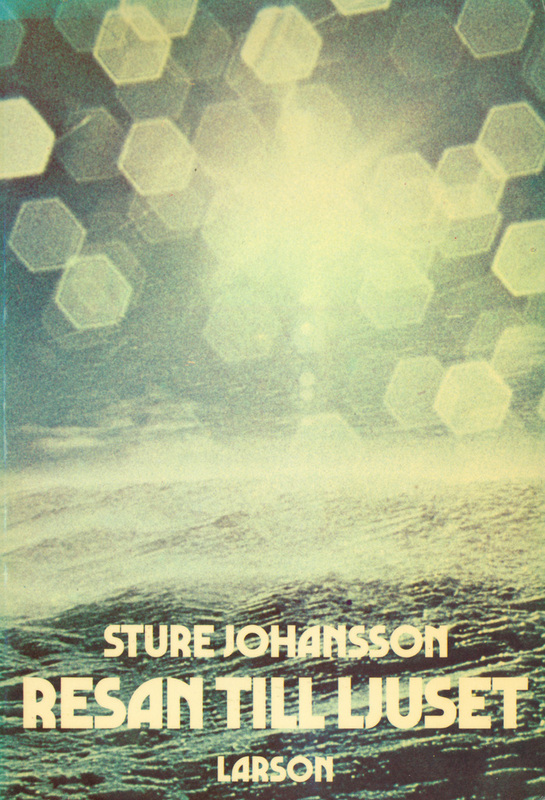 The first individual channeled by Sture called himself Simeno, whom Sture had encountered during an out-of-body experience, that affected him so deeply that he wrote a book about what happened, Resan till ljuset, 1974, (Travel To the Light). Simeno was later replaced by Ambres, who claimed that his latest incarnation was as an Egyptian merchant, Rameno Charafez, living around 1,000 years B.C. He was a member of secret society, The Tarsus Order. The teachings of Ambres became very popular and soon a group formed around the couple. 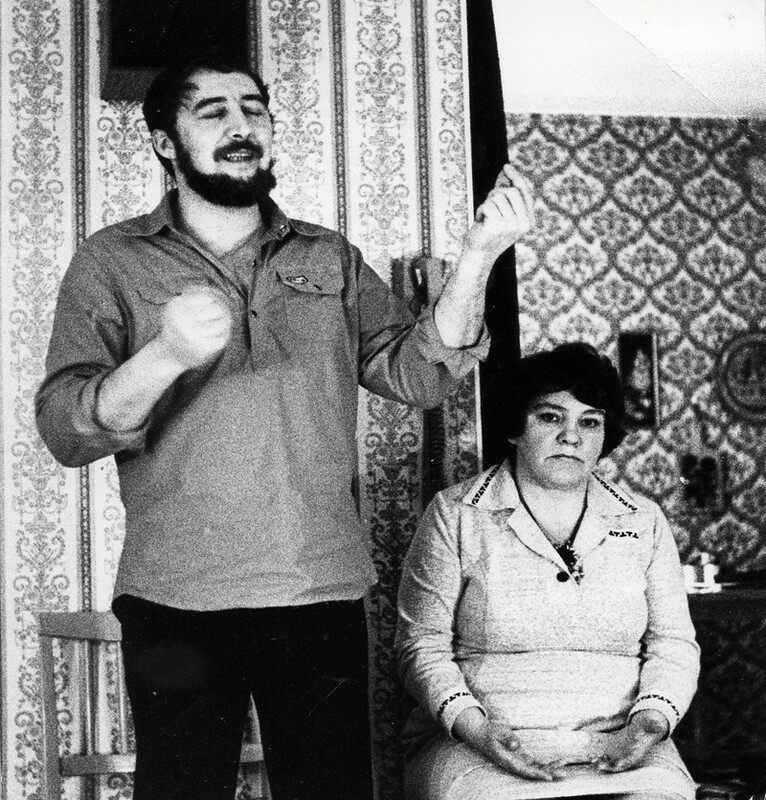 In the 1980s Sture och Turid moved to the north of Värmland, building a center attracting many followers who came from all over the world to listen to the Ambres teachings. Sture became very famous in the 1980s when celebreties like Shirley MacLaine and Dennis Weaver visited the center in Sweden. Sture and Turid travelled around the world and I have letters and postcards posted from California, Hawaii and Mexico. 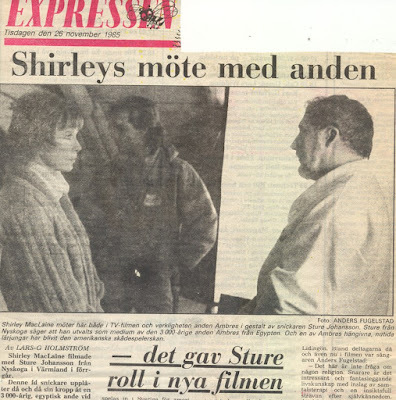 Sture also figures in the miniseries Out On a Limb from 1987, based on the bestselling book by Shirley Maclaine. Following are transcriptions with my comments from some of the first private seances in 1976-1977. ”Håkan: I am very interested in what is called flying saucers. 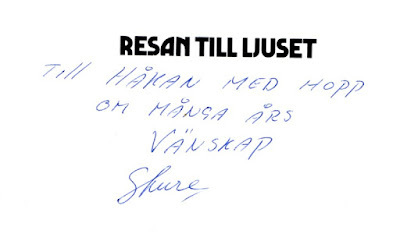 Sture (Simeno): I know that. Håkan: And I am doing some research trying to find out the deeper answers. How do you view this issue from your side? 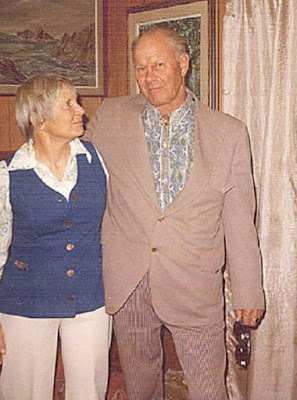 Sture and Turid Johansson had a wide experience of UFO close encounters and paranormal phenomena, which I have related in several blog entries. The basic ideas presented by Simeno are in accordance with the views shared by Sture och Turid. ”Håkan: Are there any secret spiritual brotherhoods utilizing saucers in their acitivities? This is classic Theosophical teaching, that anti-gravity aircraft, Vimanas, were used by the planetary guardians in Atlantis. ”Håkan: I am thinking about the negative entities that my friends Sture and Turid encountered. What are they, where do they come from? Turid: The ones at Väggarö. Sture (Simenon): Yes, the negative forces appear in many shapes. They are created by humans themselves and have a certain intelligent life. As long as they are nurtured they live… A sort of vampires, you could say. Turid: Thought energies with no soul maybe – from us? What happened at the frightful encounter at Väggarö on October 29, 1965 was further explained during a seance January 29, 1977. ”Håkan: May I ask, was it a magician that created the thought forms Sture and Turid observed at Väggarö? Sture (Simeno): I am aware of this, yes. Håkan: Were these entities created or did they simply exist at this place? Sture (Simeno): Are you defining a magician as someone evil? Håkan: No, not necessary. But was there a magician behind this event, someone who had sent them? Turid: We were very frightened and then you often have a black-out, paralyzed. Did we leave the car? The idea that possibly a magician could have created the entities encountered by Sture and Turid was a theory I had proposed during our many discussions of the event. As the couple lost time during this close encounter Turid was afraid that they may have been abducted, hence her last question. It was Sture and Turid who first told me of their involvement in the controversial Richard Höglund contact case, which I later spent many years investigating. During a seance on April 3, 1977 I asked about this case. ”Håkan: Who are the individuals behind Richard? Do they belong to this earth or come from some other planet? This is essentially the view we all in the meditation group shared regarding the Richard Höglund contacts and it was also the opinion of Sture and Turid. Another issue often discussed in the group was the nature and manifestations of devas and nature spirits. 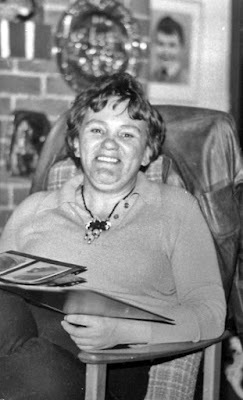 Turid Johansson was clairvoyant and often told of her observations of ”the little people”. One evening during the Summer of 1976 the group made a visit to a spot where Turid claimed she had witnessed nature spirits. While walking in the woods Turid pointed to a place where she said a deva was visible. To me it looked like a luminous dress hanging a bit above ground. 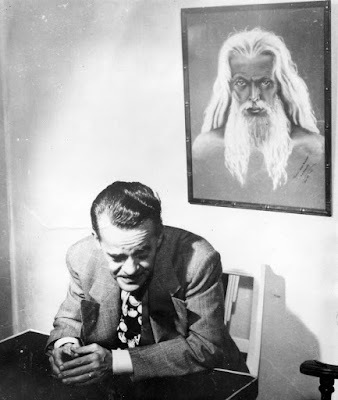 During a seance on January 29, 1977 I asked about devas and UFOs. ”Håkan: Am I right when I suggest that some of the phenomena we call UFOs are actually higher types of devas? Sture (Simeno): Yes, and I have also stated that the higher deva parallell evolution, as guardians of the planet, can manifest as saucers. During the seven or eight seances in 1976-1977 I participated there was no really new or unknown facts regarding UFOs or paranormal phenomena presented by Simeno. It was essentially a summary of the views discussed in the meditation group, although expressed in a somewhat novel form. I do not state this fact to belittle the Sture Johansson channelings. The teachings of Simeno and Ambres are in many respects inspiring and beautiful, a combination of Theosophy, spiritualism and Advaita mysticism. There is no fanaticism, life-negating ascetiscism or political extremism in the messages. ”What most characterizes spiritualists is that they permit themselves to be guided by beings in the emotional world, highly developed “spirits in the spiritual world”. The only comment necessary here is that even the most highly developed beings in the emotional world lack a true knowledge of reality and life. That knowledge cannot be acquired in the worlds of man… Spiritualists think that the medium is protected by so-called controls, who see to it that no unworthy beings use the physical envelopes of the medium. However, these “controls” have never reached beyond the emotional stage, the stage of the mystic, and they lack the requisite esoteric knowledge. They have no other knowledge of reality than the one they acquired once when in physical incarnation, and the one they receive through “pupils” who have studied esoterics. Usually, these “controls” are old Indian yogis who are detained in the emotional world through the philosophical systems they have accepted.” (Henry T. Laurency, Knowledge of Life Three, chapter on Spiritualism). In spite of the critical comments by Laurency it is interesting to note that according to The Esoteric Tradition the Spiritualist movement in the 19th century was in fact inaugurated by a secret lodge of esotericists affiliated with the planetary guardians. The object was to combat the materialist worldview by creating ”unexplained” phenomena. That a secret lodge of esotericists could have been behind the Inner Circle of medium Mark Probert is a theory I have advanced, as the messages were of a definitely unusual quality. My hope that I would receive new information on UFOs and paranormal phenomena through the channeling of Sture Johansson was unfortunately not realized. Even though the information from Simeno was not what I had hoped for regarding UFOs he did give two predictions that proved very accurate. One regarding two events in my future life that really happened many years later and one to my mother, Gun Blomqvist, during a seance in January 1977. My father, Maths Blomqvist, at that time worked as a plumber combined with singer and guitarist in a small dance-band. But he had also become interested in natural therapy. During the seance Simeno gave the advice that my father should develop his abilities as a healer as he had great gifts in this direction. This soon became reality and from the beginning of the 1980s my father worked as a natural therapist and healer. He still today, at age 86, continue this work. I refrain from speculating on the identity of Simeno and Ambres. 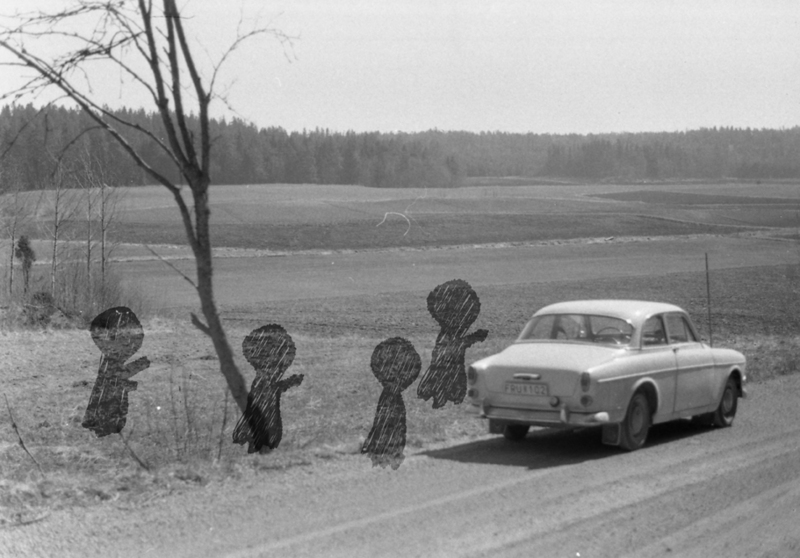 Sture and Turid claimed to have met Simeno during their out-of-body experience together. Whatever the truth in this matter I am deeply grateful for the unique experiences shared with Sture and Turid Johansson and for the varm friendship and good times together. 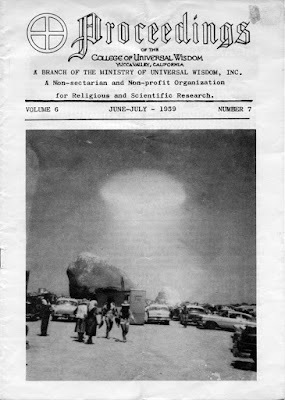 In my latest book and several blog entries I have advanced the theory that some of the physical contactees of the 1950s (George Adamski, George Van Tassel, Orfeo Angelucci, Danile Fry, Howard Menger a.o.) were involved in a cultural influence test. An psychological and sociological experiment implemented by a group of benevolent aliens, earth based or extraterrestrial. This group, wherever they came from, had access to advanced “vimana” technology. The test was only partially successful, for several reasons, and was aborted in its public phase around 1960. Most contactees had only a limited role in the project, but there were a few with a more central co-ordinating mission. One of these contactees was Dorris Van Tassel. As several times before I have received excellent biographical help from Fortean researcher and author Joshua Blu Buhs. His blog From an Oblique Angle has not been updated since June 2017 as he is now writing a book on Forteans. Joshua has provided me with much biographical data on Dorris Van Tassel. A woman that has been described as ”mysterious” by other writers. That is certainly a correct description. She had very special and unique insights into the activities of the contactees of the 1950s. 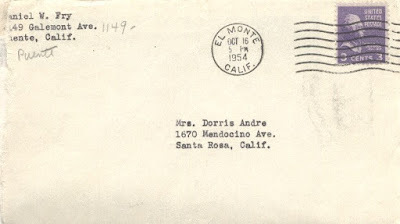 Dorris Van Tassel was born Dorris Jane Andre in Richmond, California September 8, 1912. She later changed her middle name to Ione. Her father was Alfred Nyström, who had emigrated from Finland. Mother´s name was Grace Miller. 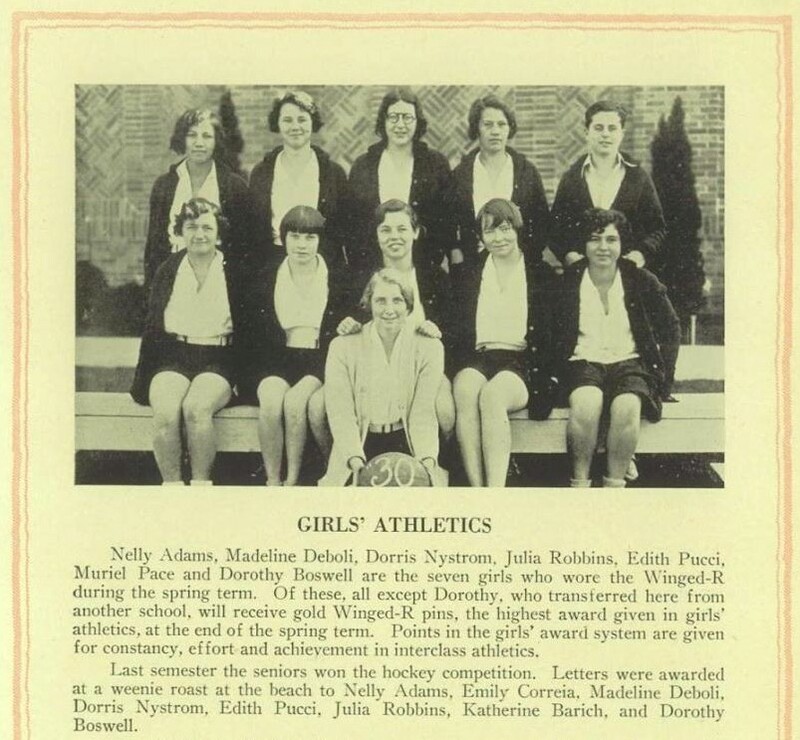 As a young girl Dorris was a very skilled athlete and received several awards for her achievements. In 1938 she married William A. Andre and they had a daughter, Marie Andre, born in 1938. 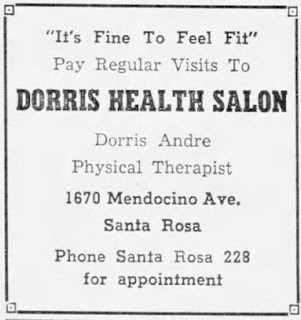 Dorris studied Physical Therapy and she eventually opened a health clinic, Dorris Health Salon, in Santa Rosa, Sonoma County, California. 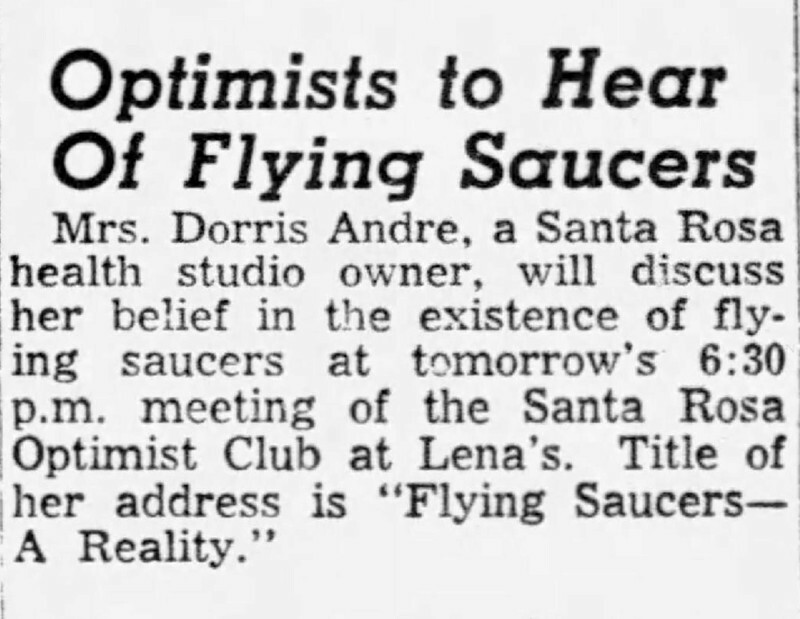 In Santa Rosa, Dorris was affiliated with the Meta-Physical Library and Workshop and in the beginning of the 1950s she developed an interest in UFOs. I have not been able to ascertain when her own UFO contacts began but it must have been in the early 1950s. 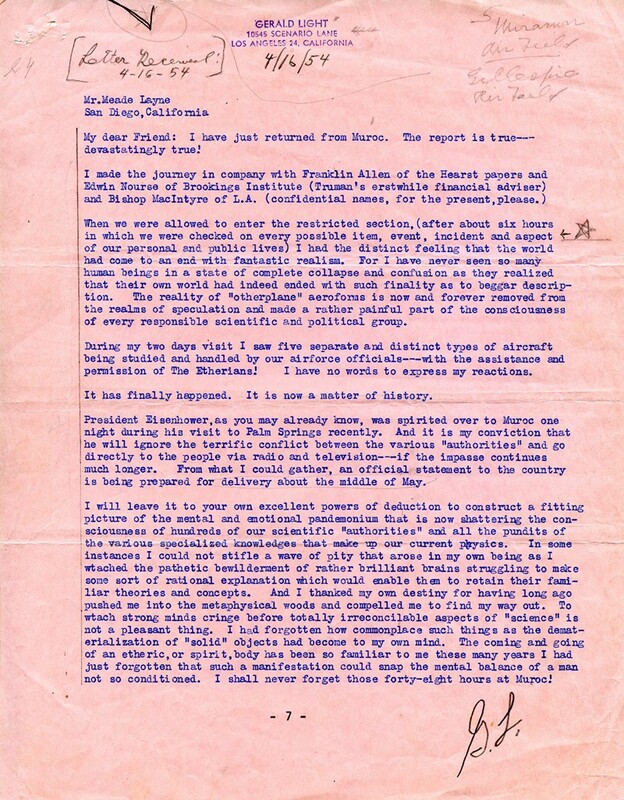 Like journalist and esotericist Paul M. Vest she decided to help the group of space people who implemented an extensive cultural and psychological test in the U.S. by contacting ordinary citizens and suggesting various missions. 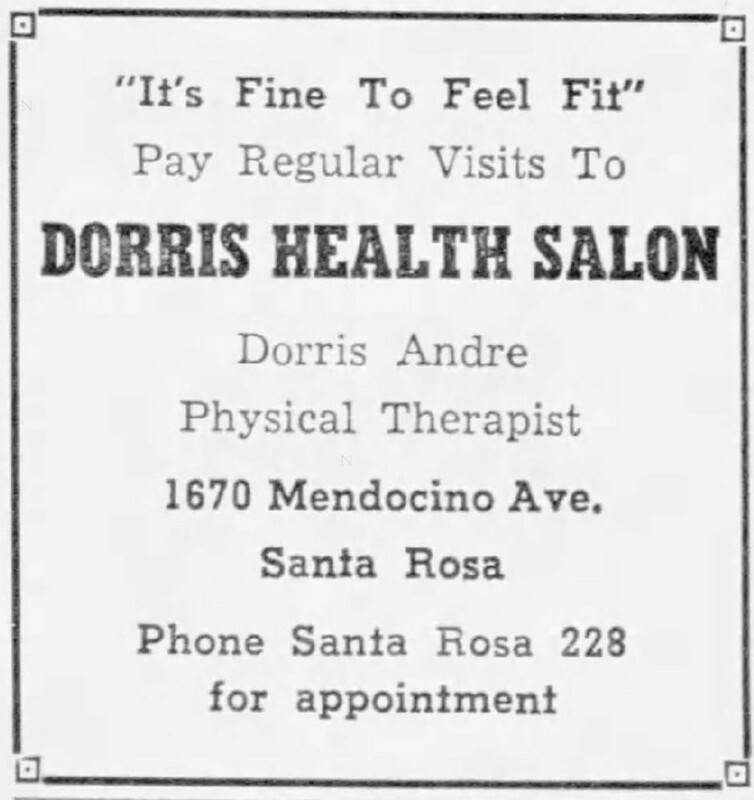 Dorris became a sort of booking-agent for many of the early contactees. She arranged lectures for George Adamski, Daniel Fry, Truman Bethurum and other contactees. 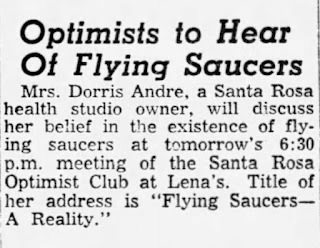 But she also occasionally lectured on flying saucers herself. 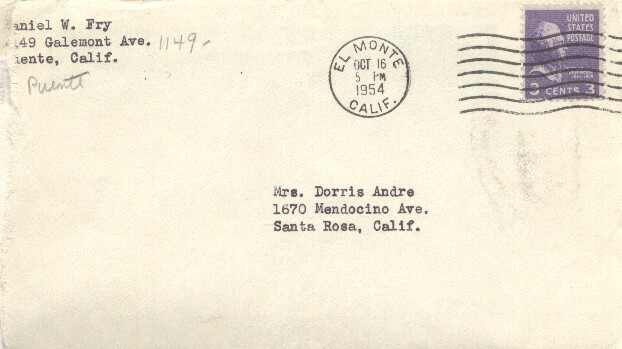 Dorris corresponded frequently with many contactees and people involved in the UFO movement. In a letter 1954 to George Adamski´s secretary Lucy McGinnis she mentioned having observed ”two disks leave mother craft on one occasion”. (Letter May 24, 1954). So far there has been very little published describing Dorris´ contacts but she gave a detailed account of her experiences at Daniel Fry´s Understanding Convention 1976. 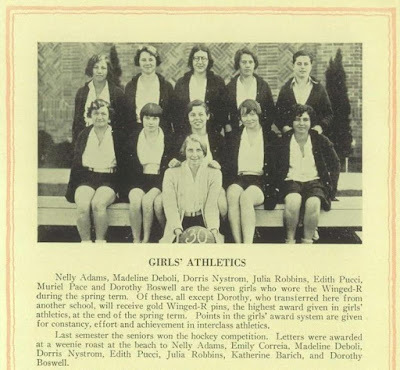 A short note of her lecture was published in Understanding magazine: ”Two women were a delightful part of the program. Dorris Van Tassel told the story of her contacts with space people, a fantastic story it was too. Until you have heard her, you´ve missed something.” (Understanding, vol. 21, no. 5, 1976, p. 6). Dorris had married George Van Tassel after the death of his wife Eva in 1975. They had worked together for many years as contactees on various projects. This was mentioned by George Van Tassel in his magazine Proceedings 1974: ”We left Los Angeles on June 6th and arrived in Atlanta, Georgia on the same day. We rented a car in Atlanta and arried in Lakemont on that evening. I was accompanied on the trip by Dr. Dorris Andre, a research associate and a friend of my family for 20 years.” (Proceedings, vol. 10, no. 5, July-Sept 1974, p. 4). 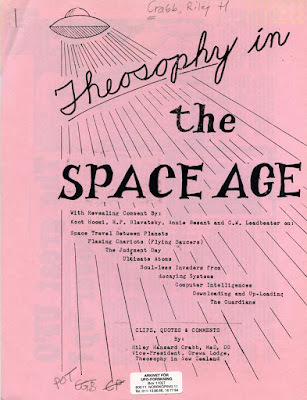 Much of the work Dorris and George Van Tassel did together with the space people has only been hinted at in Proceedings and by friends of the couple whom I have corresponded with. Not much has reached the public. Like covert agents they used code words in contacs with the visitors and they had the means to know who was really in contact with the benevolent group of space people and who were impostors. I asked my correspondent whether Dorris was aware of that these five men were space people: ”O yes, she knew them well. It was perfectly normal for her.” (Email February 26, 2012). Dorris Van Tassel died on June 30, 1991. She was certainly a woman of mystery, involved in many behind the scenes activities with the visitors. Researching the history of the 1950s contactees is like opening Chinese boxes. You open one and find another box inside – with a still deeper mystery. 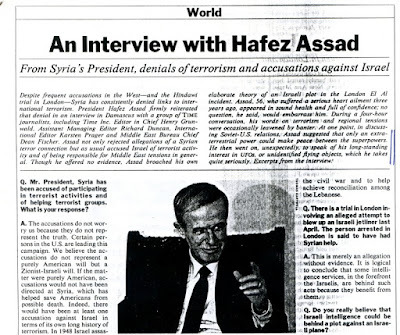 Readers of Time magazine October 20, 1986, probably raised a few eyebrows when confronted with statements made by Hafez Assad, former President of Syria. 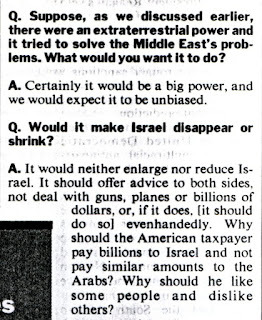 In an interview he was very open-minded about his long-standing, serious interest in UFOs. 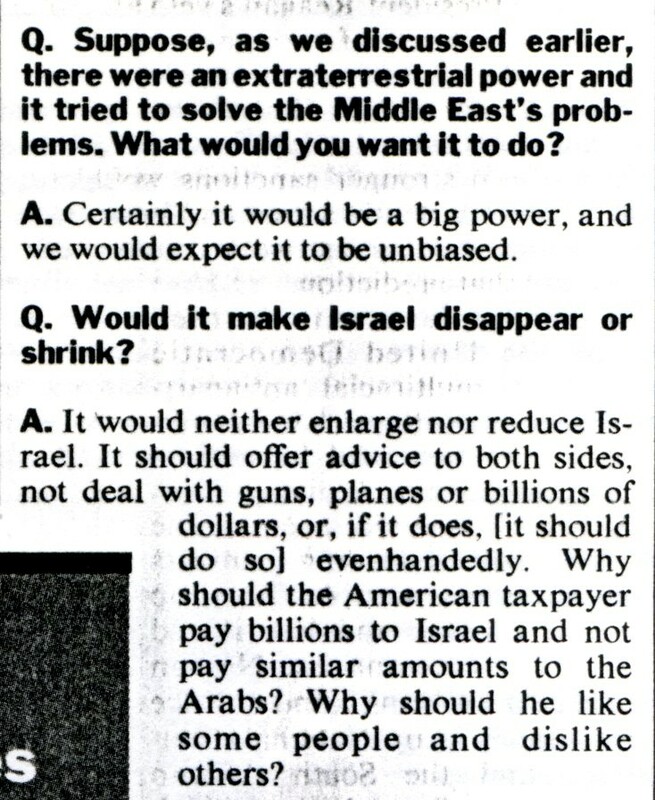 When asked about how an extraterrestrial power would solve the problems in the Middle East, Assad offered this wise, philosophical answer: ”Certainly it would be a big power, and we would expect it to be unbiased… It should offer advice to both sides, not deal with guns, planes or billions of dollars…”. Syria has been very much in the news for several years now because of the terribly brutal proxy war going on. It is the focal point for a global conflict of almost apocalyptic dimensions where many cities have been reduced to rubble. When following this war in the media I am reminded of a strange and rather ominous prophecy allegedly coming from space people in 1969 and delivered to New Zealand ufologists Fred and Phyllis Dickeson. The commentary on extraterrestrial intervention by Hafez Assad are interesting especially when compared with statements found in The Esoteric Tradition. 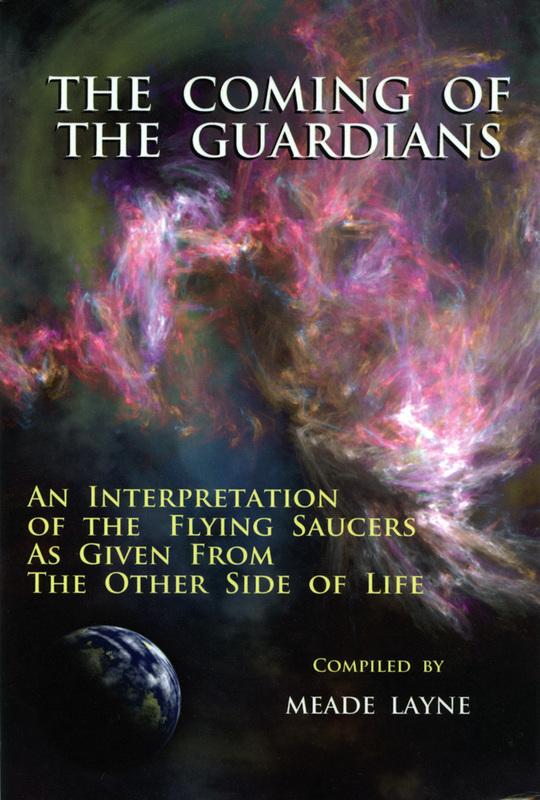 These are not the usual naive love and light messages found in many New Age channelings but rather realistic pronouncements about both guardians and invaders from other planets. Generally we are told that extraterrestrial help has been given several times in the past: ”Many great Beings from planetary and solar sources, and once or twice from cosmic sources, have at times lent Their aid and dwelt briefly upon our planet.” (Alice Bailey, Initiation, Human and Solar, p. 37, originally published 1922). 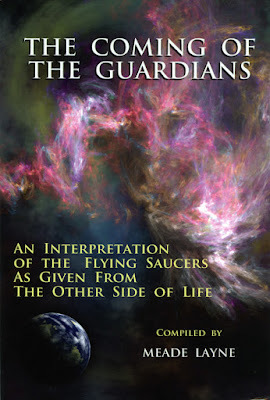 Seen in this perspective the title of Meade Layne´s book, published in 1950, The Coming of the Guardians, is certainly very appropriate. Besides giving behind the scenes assistance to our planet during a critical period, a special group of these guardians made a cultural and psychological influence test and information effort in the 1950s, mainly in America. Involved in this test were in my estimation a.o. George Adamski, George Van Tassel, George Hunt Williamson, Orfeo Angelucci, Daniel Fry, Paul M.Vest and Howard Menger. The test was only partially successful as some of the contactees could not stand the strain of the contact and misinterpreted the information given. The object of the interplanetary guardians was first and foremost to prevent total destruction of the planet as mankind was now capable of such acts because of the discovery of nuclear energy and weapons. According to The Esoteric Tradition this had once happened before in our solar system when the planet between Mars and Jupiter had been totally destroyed by its inhabitants. On August 17, 1952 George Hunt Williamson and his group received the following message: ”We must now decide what to do about your planet Earth. Your bombs will destroy Universal balance. Your Hydrogen Bomb could make an asteroid belt out of you. This happened many years ago to planet of the fifth orbit. We knew what they were doing but we didn´t interfere. We cannot stand by and see another waste.” (George Hunt Williamson, The Saucers Speak, Neville Spearman 1963, p. 52). 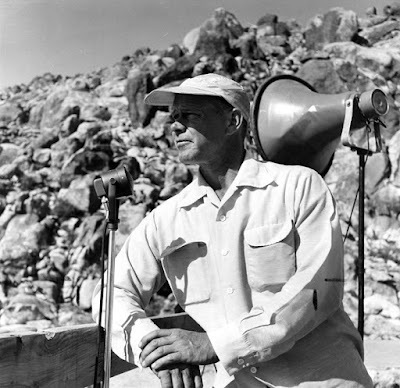 Compare this with the information received by George Van Tassel on July 18, 1952: ”Your materialists will disagree with our attempt to warn mankind. Rest assured they shall cease to explode life giving atoms, or we shall eliminate all projects connected with such. Our missions are peaceful, but this condition occurred before in this solar system and the planet Lucifer was torn to bits. We are determined that it shall not happen again. The governments of the planet Shan have conceded that we are of a higher intelligence. They must concede also that we are of a higher authority.” (George Van Tassel, I Rode a Flying Saucer, 2nd ed. 1952, p. 32). Earth is called Shan by the space people. Information about planetary and interplanetary guardians is not difficult to find in The Esoteric Tradition and contactee literature. When it comes to invaders or evil extraterrestrials the issue becomes somewhat more complicated. Data on this problem is scarce in esoteric sources and in contactee and UFO literature hard to evaluate. 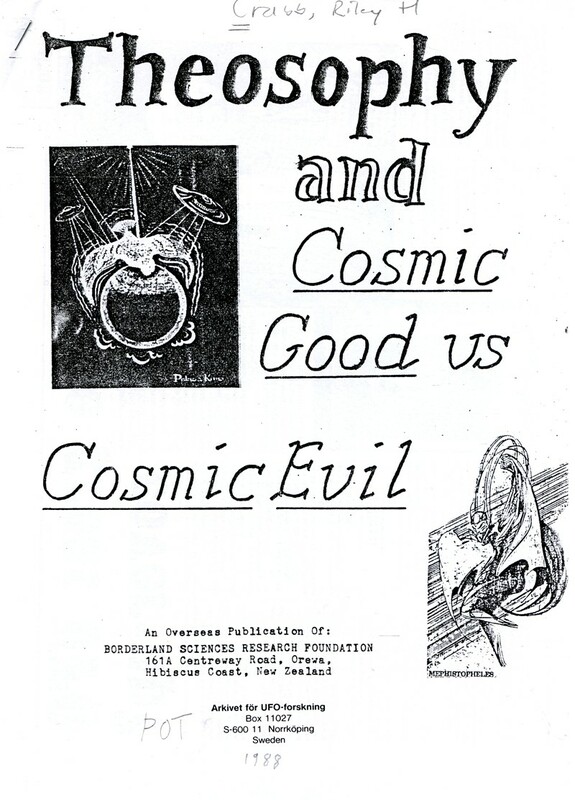 Esotericist RileyCrabb made a commendable effort to study the problem of Cosmic Evil. In several booklets he compared esoteric and UFO data from many sources, not always very reliable. 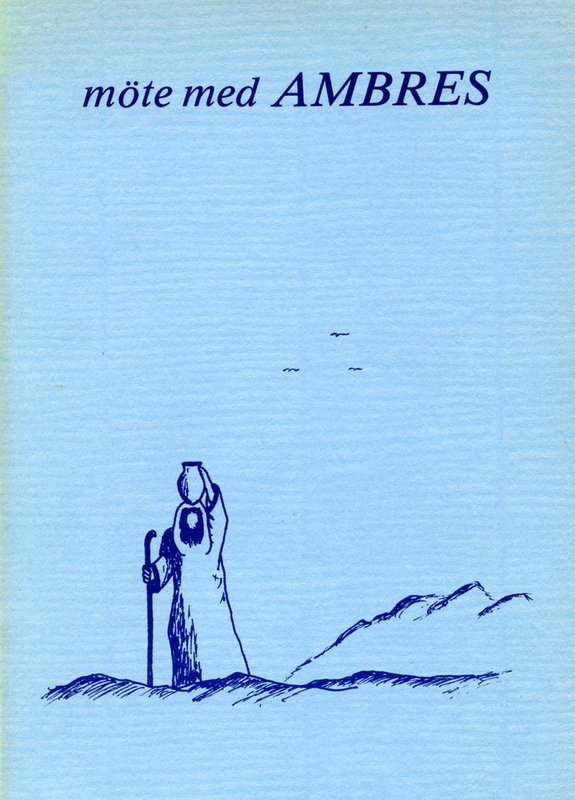 Crabb also made regular comments on planetary and interplanetary evil as editor of Round Robin – The Journal of Borderland Research 1959-1985. As our planet is a form of interplanetary Alcatraz we have, besides the ”bad boys club” (planetary evil) also to contend with what in esotericism is called cosmic evil. Visitors from other planets who are dangerous and only wish to use this planet and people for their own purposes. There is a interesting comment about this menace in The Rays and the Initiations by Alice Bailey: ”… the place were another kind of evil dwells – an evil which is not indigenous to our planet, an evil with which it was never intended that men should deal.” (p. 753). This was one of the last messages given in 1949 by the Tibetan to Alice Bailey. Did he try to warn humanity of what was to come? 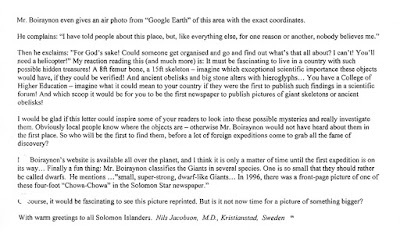 Sometimes I have wondered whether I accidentally happened to uncover an aspect of cosmic evil in action in when researching and documenting the Swedish contactee Richard Höglund? Some of the early contactees involved in the test with the benevolent visitors were warned about dangerous aliens also interacting with earth people. 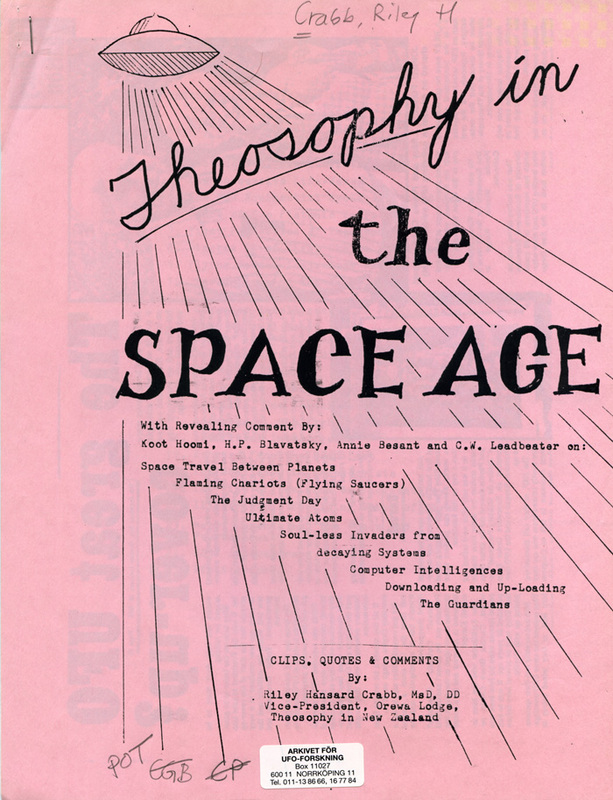 In 1956 Howard Menger was informed about ”a very powerful group on this planet, which possesses tremendous knowledge of technology, psychology, and most unfortunate of all, advanced brain therapy.” (Howard Menger, From Outer Space To You, p. 143). During the 1950s there was much hope and goodwill in the messages coming from UFO contactees. Daniel Fry formed the organization Understanding with around 70 local units and 10,000 members. George Adamski started International Get Acquainted Program (IGAP). But beginning in the 1960s disturbing UFO incidents began to be reported more frequently - abductions, cattle mutilations, Men In Black encounters etc. It certainly looked like someone was, and still is, pretty good at ”advanced brain therapy” for whatever reasons. As a ufologist and esotericist it is extremely difficult to grasp the big picture when it comes to UFO experiences, claims and contacts since the 1950s. From various whistle blowers and some contactees it is stated that President Eisenhower had a meeting with the planetary guardians in 1954 and was given an offer of help and co-operation. This was rejected and later a meeting was arranged with a group of aliens who offered advanced technological information. In exchange they were allowed to abduct a small amount of humans and animals for study purposes. Soon the secret military and intelligence group that made the deal discovered they were deceived as the aliens abducted thousands of humans and animals. Since then a secret war has been waged behind the scenes. A war that it would be impossible to disclose to the public without causing panic. As for the truth regarding this scenario I can only say, interesting and scary – if true? 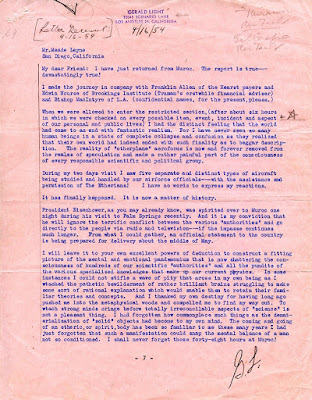 The first claim that Eisenhower had a meeting with extraterrestrials in 1954 came from American occultist Gerald Light (Dr. Kappa) in a letter to Meade Layne. This unique, original letter is now in the custody of AFU. In 2009 a most unusual and controversial book was published, Solomon Islands Mysteries by Marius Boirayon. The author presents a somewhat new slant to the alien conflict scenario. 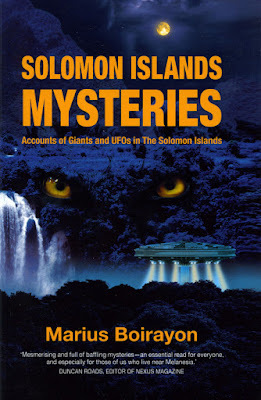 He claims to have discovered that a race of previously unknown giant hominoids and a dangerous extraterrestrial species live in bases below the Solomon Islands and that this is know by secret intelligence groups: ”No-one can make me believe that certain ultra-secretive intelligence organizations within the United States, British and Australian governments do not know about the subterranean civilisations of the Solomon Islands, as I have overwhelming proof that they do”. (p. 282) Boirayon further states that the people that made the deal with the evil extraterrestrials has developed into a ”breakaway ultra-secret group”, a sort of ”worldwide club that have become more evil than good… It´s bad luck for them, as their sordid love-hate alliance will not last, and as we will se within the next decade, they picked the wrong side.” (pp. 304-306). 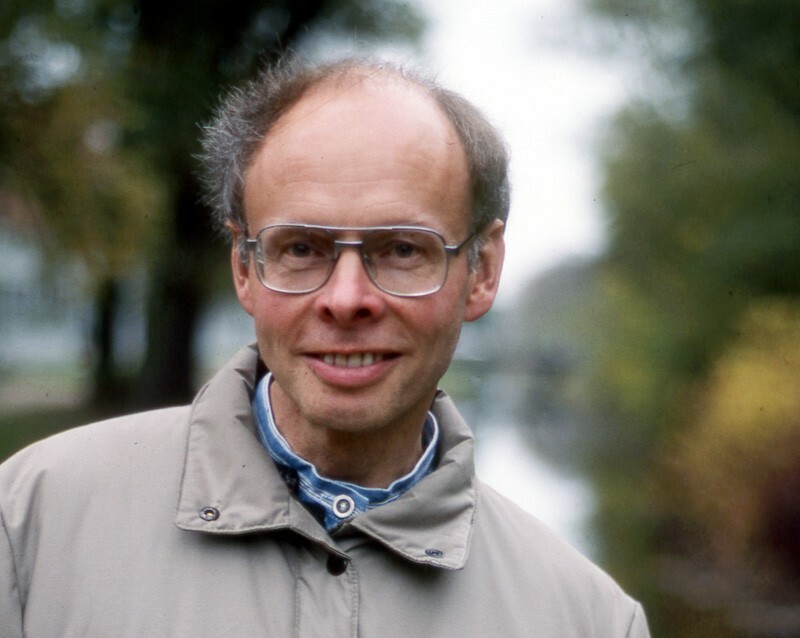 One of the researchers who became intensely fascinated by Solomon Islands Mysteries was Swedish psychiatrist and parapsychologist Dr. Nils-Olof Jacobson (1937-2017). 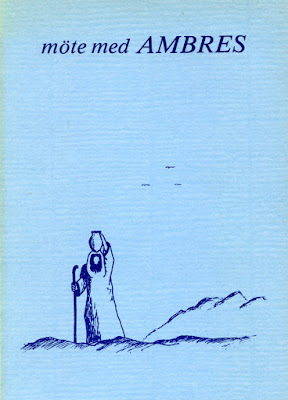 Well-known for his book Liv efter döden (1971), English ed. Life Without Death (1974). 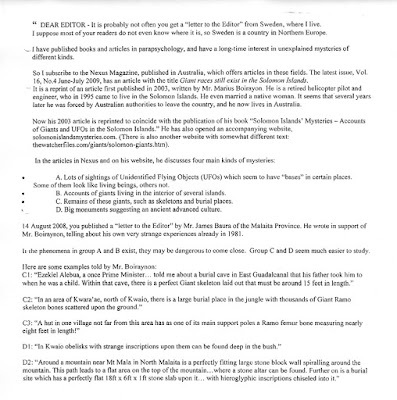 He began searching for more data on the claims of Marius Boirayon and even succeeded in getting a letter to the editor published in Solomon Star News in June 2009. 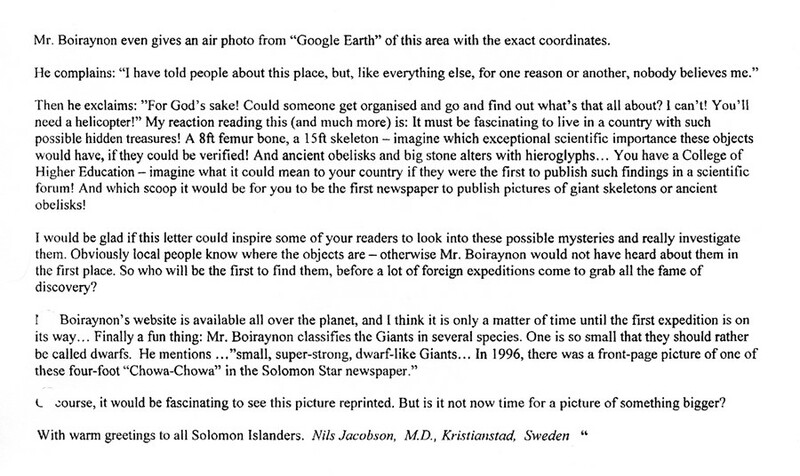 I corresponded with Nils-Olof Jacobson in 2010 about his research. He had received a short e-mail from Marius Boyraion who mentioned that he had been warned not to continue his research or contact other people with the same intent. 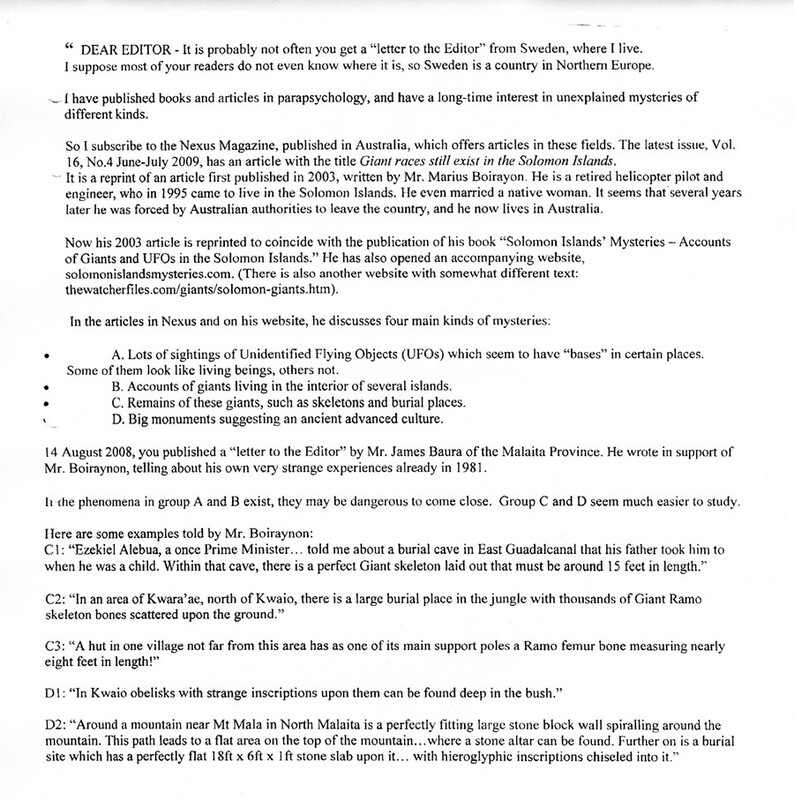 Jacobson had also corresponded with Mr. James Baura, who had written an article on Solomon Islands Mysteries. Unfortunately not much new information on the mystery appeared because of these research efforts. 1. Join the fight, hopefully on the side of the Angels. 2. Try the mission impossible option of going public with your knowledge. 3. Write a novel and in fictional form present what you know. 4. Document your knowledge and preserve it in a safe-deposit box, to be published after your death. 5. Forget the whole thing and try to live a normal life.